Visiting Chinese Premier Wen Jiabao stated on Thursday that China has endeavored to provide assistance without any political strings attached to African brothers and sisters. The Chinese premier made the statement while addressing more than 800 Chinese and South African business people at a business forum held in Cape Town. Wen Jiabao stressed: "We do not seek to export our own values and development models to Africa." This year marks the 50th anniversary of the inauguration of diplomatic relations between China and African countries. 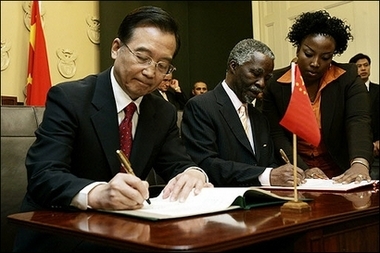 "Over these years, we the Chinese and Africans have supported each other in the fight for national sovereignty and dignity, worked hand in hand in the pursuit of economic development and better livelihood, and maintained close coordination in the cause of upholding world peace and safeguarding the rights and interests of the developing world," Wen added. According to the premier, China has completed some 900 projects of economic and social development in Africa, provided scholarship for 18,000 students from 50 African countries to study in China and sent 16,000 medical personnel to 47 African countries, who have treated 240 million patients. Wen said that over 3,000 Chinese peacekeepers have been involved in peacekeeping operations in hot-spot areas in Africa. "China also actively promotes trade with Africa, helps ease its debt burden, supports regional cooperation and helps Africa to achieve self-development," he added. The Chinese premier stressed: "Mutual support is a key feature underlying China-Africa relations, and we in China will never forget Africa's support to China." Over the decades, Africa has always firmly supported China on major issues involving China's national interests, especially the restoration of China's lawful seat in the United Nations, the Taiwan issue and human rights. Wen said that China also received Africa's support in its successful bid for hosting the 2008 Olympics and 2010 World Expo. "I am firm in the conviction that no matter how our world may change, the friendly ties between the Chinese and Africans will last," he said.